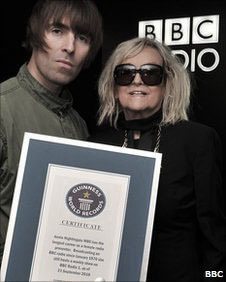 BBC Radio 1 DJ Annie Nightingale was yesterday awarded the Guinness World Record for having the longest career as a female radio presenter. Liam presented the award to Anne on the 21st of September, which happened to be his birthday. Liam said "Annie is a true icon of British Radio. She's been on Radio 1 since before I was born. Good on her for getting this record. I hope she's still here in another 40 years!" Read the whole story on BBC Newsbeat.